Follow these steps to import and display a MusicXML score in Harmonia. Once a score has been imported it can be added to Harmonia documents to create lessons and gradable composition or analysis assignments. Before attempting to import a MusicXML score into Harmonia, first open it in a notation editor and make sure the score provides all the information Harmonia requires in order to properly display and analyze the music. Importing MusicXML from Finale and Sibelius works fairly well. MuseScore also works, but because you cannot associate modes with key signatures, you will need to edit the MusicXML file to add this information before attempting to import the score into Harmonia. Because Harmonia analyzes music scores, it maintains certain requirements that standard notation editors do not necessarily enforce. Thus, the first step in the importation process is to load the score into your notation editor and perform the following checks, making sure resolve any issues before trying to import the data into Harmonia. All score parts must be complete with no missing or rhythmically incomplete measures. All score parts must provide an initial clef, meter, and key signature with a mode assignment. Harmonia expects key signatures to provide the mode and it uses the initial key declaration as the "home key" for its analysis. The score must be non-transposing, i.e. all parts must use the same key and meter elements. Treble staff: soprano in layer 1; alto in layer 2. Bass staff: tenor in layer 1; bass in layer 2 (or alternatively: tenor in layer 3; bass in layer 4). View of sample score in Sibelius. Note that the key signature has a mode and the pitch colors in the bass and treble staves show the 1,2 and 1,2 voice ordering. Note that if your original notation contains any existing lyrics or analytical details (e.g. roman numerals or figured bass symbols), these details will not be imported. Harmonia only reads and imports musical notes. Harmonia does not display lyrics (though these may be added to a Harmonia document later) and the software will determine its own analyses. Once your score is ready, the final step is to export it from your notation program as a MusicXML file. 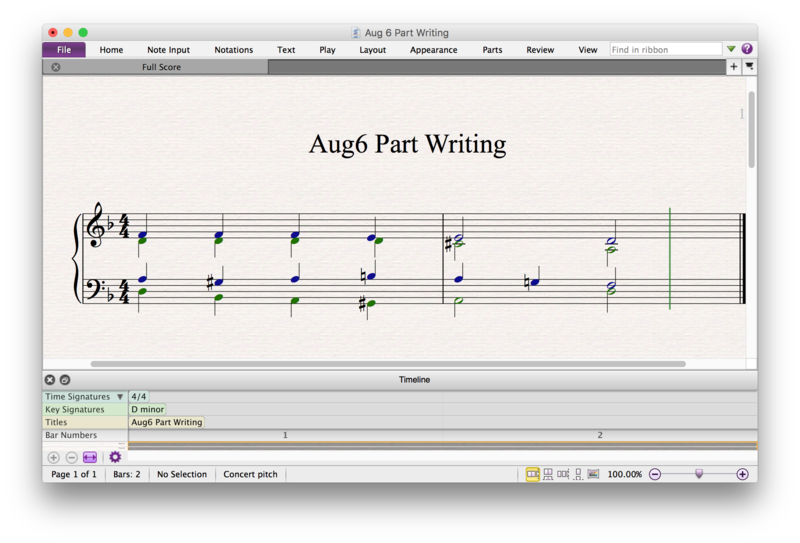 Follow your notation editor's guidelines for saving your notation in MusicXML. Save your file in an uncompressed MusicXML format and use the extension ".xml" for your file. To import a file into Harmonia you must first log in to the Harmonia Cloud server. This login step verifies your teacher status and enables numerous application features, including importing, that are otherwise not available for students. Once you have logged in, use the Import MusicXML... command in File menu to import your file. Once connected to the cloud, the white cloud icon on the left will turn blue. 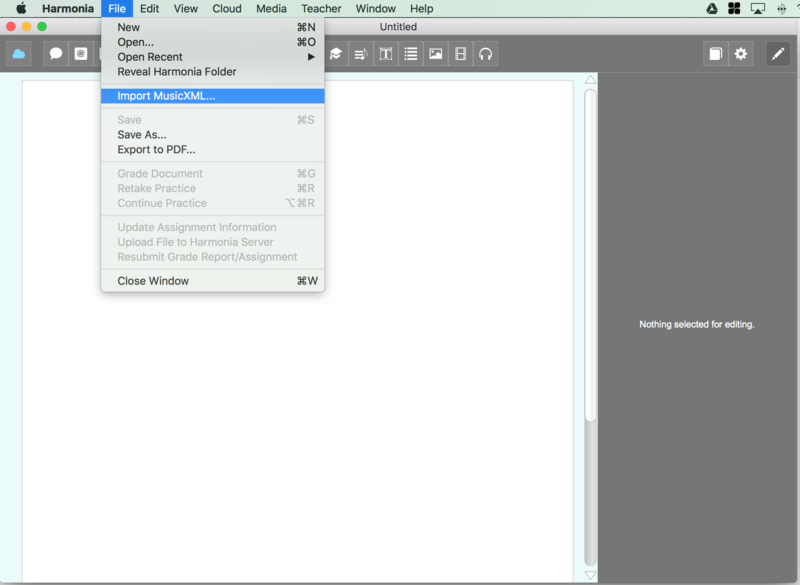 After logging in, the teacher icon will appear at the top-center of the window and score importing will be enabled in the File menu. Upon selecting an MusicXML file, an Import Dialog box will open. Use this dialog to verify the score contents (such as meter and key) and to select the kind of analysis you want Harmonia to apply to the imported score. You may also input or edit a title, composer, and copyright information if desired. View of the Import Dialog in Harmonia. Use this to check and customize the importing process. Any problems Harmonia encounters during the import will be appear in the Errors and Warnings tab. Harmonia currently recognizes six kinds of analyses, each of which depends on certain conditions being valid in an imported score. Harmonic Analysis includes key, roman numeral, chord inversion and harmonic function in chordal textures. In four-part scores the analysis includes additional stylistic checks for proper voice leading and doubling. A score that undergoes harmonic analysis also supports chordal analysis. This is the most common kind of Harmonia analysis and selecting this option enables many different kinds of assignments to be created. Chordal Analysis includes chord quality, inversion and root detection for triads and seventh chords. This analysis type will never try to determine a key or harmonic function. This is a limited version of Harmonic Analysis suitable for making introductory harmony assignments. Interval Analysis includes interval quality and distance (size) in two-voice textures. This is suitable for creating interval notation or analysis exercises. Interval scores may contain either two staffs with a single melodic line in each staff, or one staff with a series of simultaneous dyads. Pitch Analysis includes pitch and pitch-class analysis of notes on a single staff in a single voice texture. This is suitable for making pitch or pitch-class notation or analysis exercises. Some teachers have successfully used this analysis type to create synthetic (whole-tone, hexatonic, and octatonic) scale exercises and even melodic dictation exercises. Scale-Degree Analysis includes tonal (key) degree analysis of a single staff, single voice texture. Scale degrees are fixed, i.e. scale-degree 1 is C.
Roll-Your-Own Analysis will turn off Harmonia's automatic analysis engine and create empty theory line entries for users to fill in with roman numerals as needed. Once complete, the notation can then be turned into a roman numeral analysis assessment, but not a roman composition assessment. Once you have selected the score's analysis type and confirmed the other dialog attributes, click the Import button at the bottom of the dialog box to import the score into Harmonia. Once a score has been imported from MusicXML it can be used over and over again to create lessons and assignments. Perform the following actions to add an imported score to a document. Click on the score icon at the top of the application window to open Harmonia's Score Chooser dialog. The drop-down menu at the top of the chooser defaults to the 371 Bach Chorales. 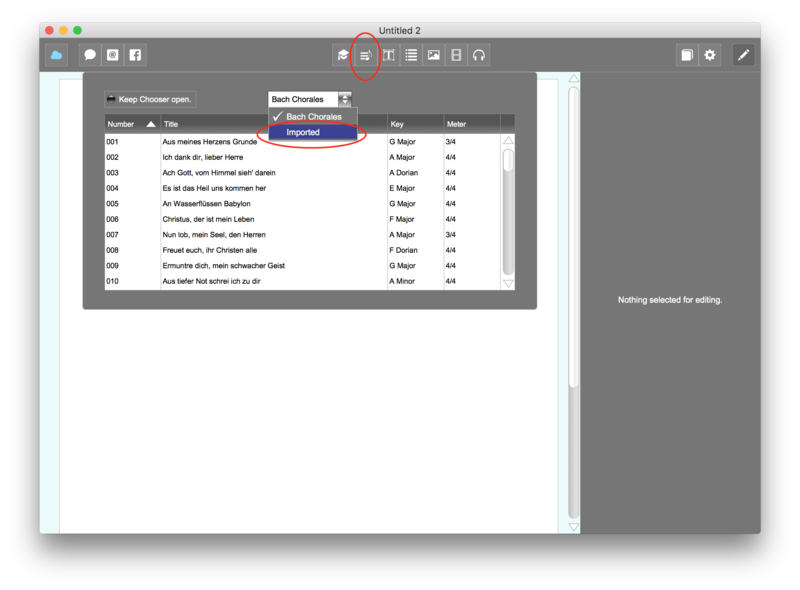 Click on the drop-down menu and select the Imported menu item. The chooser will then display a list of all your imported scores. Select your desired score and double-click it to add it to your document at the current cursor position. 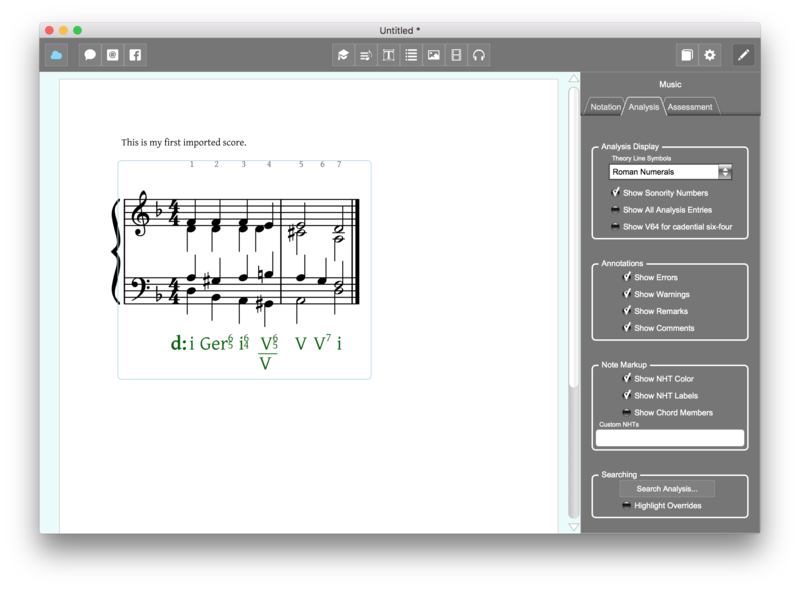 Once the score is added to the document, Harmonia will automatically analyze it in real time and display the results in a theory line below the score. Use the Analysis menu on the right side of the window to view a variety of analysis types. Note that dragging the notes around on the score will change the score and its analysis. At this point you may add more elements to your document such as text, videos, images, and other scores, or you can simply convert the score into an analysis or composition assessment to upload to your course on the server. In general, Harmonia's current notation engine does its best job displaying SATB-voicing on a grand staff. It can, however, display piano and ensemble scores with some caveats. There are some score objects that Harmonia can import, but cannot currently display, such as beams, slurs, and triplets, some of which are slated for inclusion in later releases. ( We expect beams to be included in our summer or fall 2017 release.). Harmonia can accommodate multiple staves and a wide variety of clefs and key changes, but the standardization of these elements is still under development. Harmonia currently does not analyze linear textures very well; such textures should be imported using the Roll-Your-Ouwn Analysis type.